and here’s the hopeful edge in this exploration of lace which I am working on for the next year or so to join the conversation with the inspiring circle of cloth conjurors over at Jude’s Spirit Cloth Diaires. 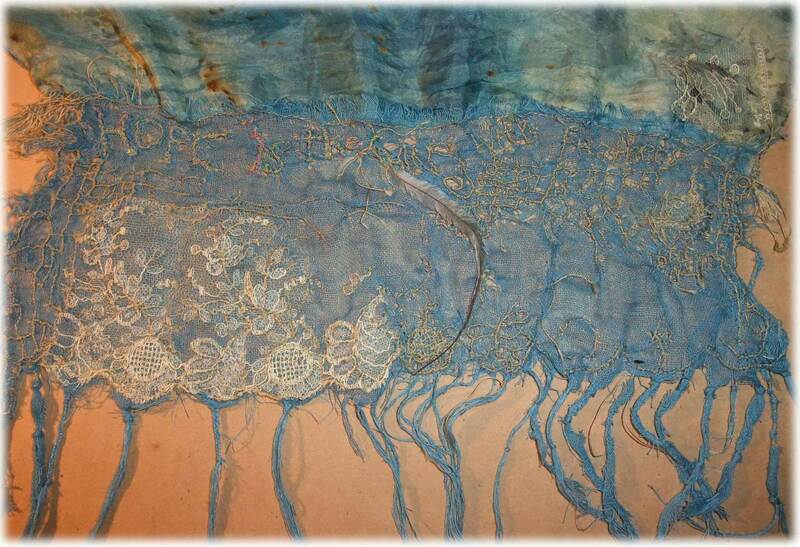 The beautiful transparent materials & moons are from Glennis Shibori Girl, the indigo & rust dyed silk is from Arlee Barr and the wonderful threads and antique lace are from Margaret Johnson. For the next little while I will be beading and stitching emu feathers into both ends to give the scarf a sense of balance and then see where it wants to go next! I play with the stitching & cloth each morning for an hour or two to limber up the eyes, heart and mind for the crow drawings. These two projects bounce well off each other, when the stitching gets too tight and fiddly I go to the drawing feeling all free & fired up, then when the lines of the drawing get too wild and mad I go back to the stitching to bring back the focus with touching the gentle materials. looking fabulous Mo, these works are really developing beautifully. thanks for the good words Bronwyn! Words fail me, Mo, this is so very lovely. Hi Carol, the stitching is such a gentle way to start the day & fits with a lifelong dream of making lace in my sunset years which have begun a little earlier than expected with needing much stronger glasses and my hands are getting less agile just this year. This work is absolutely beautiful, Mo! Hi Julie! good to see you here! Beautifully intricate…..& looks so fragile but I am sure with all your stitching your strength is part of it all. Hi Eliene, taking it very slowly, there’s no rush and it’s already surprisingly strong! This is lovely Mo, Having been in the isolation of a highly stressful week it was good to emerge to beauty. Hi Charlotte always good to see you (& your wonderful work) hope next week is a lot easier!! Thanks Mo, we have just been through Ofsted (inspection of school by the government) It is a very stressful experience for all involved. The hopeful lunacy scarf…. the name conjures up such amusing images in my mind….. Mo on a bicycle tearing down the street with scarf flying out behind… and a crow on the handlebars. hehe, not so far from the truth Robyn! I don’t have a driver’s license and ride an old Raleigh pushbike circa 1970! You do these things so absolutely beautifully! Your artistic muse is solidly attached to you!!! thanks for the good words Carol & you remind me to pay my respects to the muse! “when the lines of the drawing get too wild and mad” LOL, I can’t relate to this. Early fascination with scientific illustration made me a control freak, so drawing for me is contemplative or intensely focused, rather than emotional or adventurous. I usually have some kind of embroidery project going (clothing, wall hangings, etc.) and do more of it when I’m stressed or my energy is low, since it is comforting, repetitive, and (as you point out) it is satisfying to watch the piece grow stronger with the stitching. your drawings are beautiful Lorena, love your attention to detail & can relate having worked as a botanical illustrator in the 1990’s, you can see some of them here . Have been trying to free up the lines with the crow illustrations and they are getting there, you can see the series so far here. i am so slow to get around…but…. it is just so FINE, Mo…and delicate. 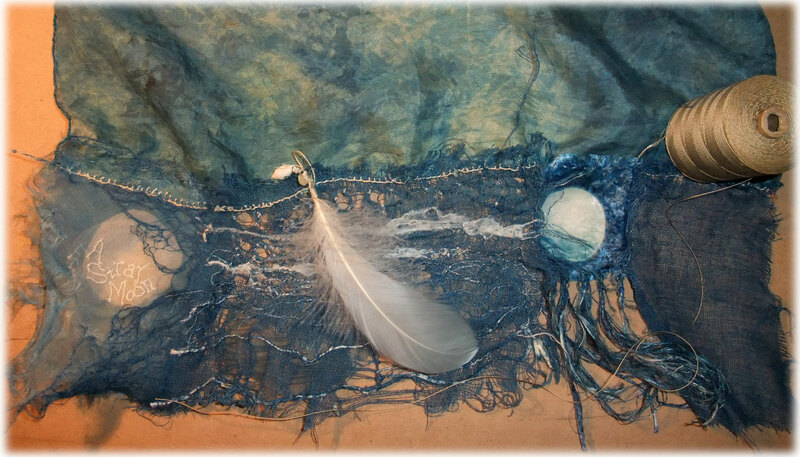 i love looking at it here………..
Hi Grace, your stitching and words are such an inspiration on so many levels! Mo, I think this is stunning…it’s so delicate. fragile…in a ‘precious’ kind of way. Your blog is amazing. I love the drawings and the links. I’m bookmarking you and why haven’t I seen you before???? gosh thanks for visiting Karen, what you are doing with your lace veil and all the experimenting with drawn threads and wrapping and layering and textures is a constant inspiration!